This is the second in a possible series featuring Troy Chance, a freelance writer who lives in upstate New York. The first book, Learning To Swim was excellent so I just went right away and got this one. Troy is startled to learn that the body of a man buried under the ice is a friend. How did this happen? It turns out he is the wealthy boyfriend of a roommate and it doesn’t seem like the death was an accident. 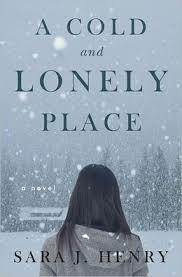 A Cold and Lonely Place isn’t quite as good as Learning to Swim but it’s still a very fun read – Craden does an excellent job with the reading. Oh thanks for that news! I’ll be looking forward to the next books now! Done! That was tricky because I checked after your first post but I saw with my own eyes that the middle initial was correct. (LOL!) So now I realized that the “H” you were referring to was in the name Sara(h). Thank you!